Crystal Nebulae | Orbits – What Keeps The ISS Up? Orbits – What Keeps The ISS Up? Home / Orbits – What Keeps The ISS Up? One obvious question to ask is what keeps the ISS from crashing to Earth. The explanation goes back to Isaac Newton, who was the first to figure out that the pull of gravity that makes an apple fall from a tree is the same force that keeps objects like the Moon in orbit around the Earth. He conducted a thought experiment in which a cannon was hauled to the top of a high mountain (see right). A ball fired from the cannon would fall to Earth, but would travel a little further than would be expected on a flat surface because the curvature of the Earth makes the surface fall away as the ball approaches. 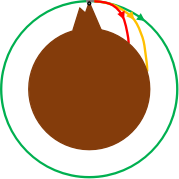 Adding more gunpowder to the cannon would make the ball travel further, until a point would eventually be reached when the surface of the Earth would be falling away at exactly the same rate that the ball was falling toward it, so the distance between the ball and the surface would stay constant – the ball would be in orbit. Near the surface of the Earth, the speed required to achieve orbit is around 27,000 km/h, almost ten times the speed of a bullet. Such speeds would generate huge amounts of friction within the Earth’s atmosphere which would cause the orbiter to burn up, which is why satellites like the ISS have to orbit at altitudes above almost all of the atmosphere.